There’s a brand new pantomime team installed at Doncaster’s Cast and Ben Crocker and Chris Lawson have marked the occasion by mashing up two family favourites. Robin Hood and the Babes in the Wood is, as the title suggests, the tale of the Loxley outlaw doing battle with the Sheriff of Nottingham to rescue the titular babes in Sherwood Forest. 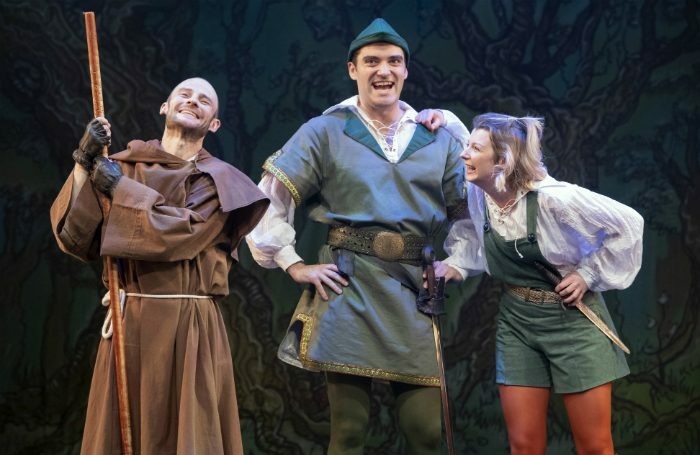 Despite the new creative team, the show sticks pretty closely to the Cast panto formula – and it’s mostly done very well, with Robert Took reprising his role last year as a camp panto dame embarrassing an unfortunate dad in the front row, cover versions of chart hits and some comedy booing of the villainous Sheriff (played with relish by the excellent Ian Crowe). There are no celebrities in the cast, but rather an ensemble of experienced entertainers, including a BSL interpreter, Naomi Gray, onstage throughout. Crocker’s script does become a bit muddled at times, and some momentum is lost during the show’s second half, while the obligatory mentions of the corporate sponsors Lakeside Village are rather awkwardly crowbarred in. It all goes down very well with the audience of mostly young children though, who get to throw rubber balls at the stage and dance uproariously to Baby Shark, just one of many cover versions that musical director Matt Marks deals with expertly. There are probably slicker, more gimmick-filled pantos around this Christmas season, but Cast’s new team has produced an enjoyable, fun festive treat for Doncaster.